Get ready Nigeria! The biggest and most inspiring dance show ever is going down this Independence Day. It is time to create lasting memories with a mind-blowing dance show that is set to elevate your soul and open your heart to a new dimension of life; a revelation that the eyes of many have been blinded to – one that could change our nation forever. Get ready for ‘Glimpse’, presented by the Spirit of David Gospel Dance Club. Venue: Banquet Hall, National Arts Theatre, Iganmu, Lagos. Since 1999, Spirit of David has upheld the mandate of spreading inspiring messages with timely themes of peace, freedom and new beginnings, every October 1st to commemorate the Independence Day but this year 2017, there is a twist to the message direction. 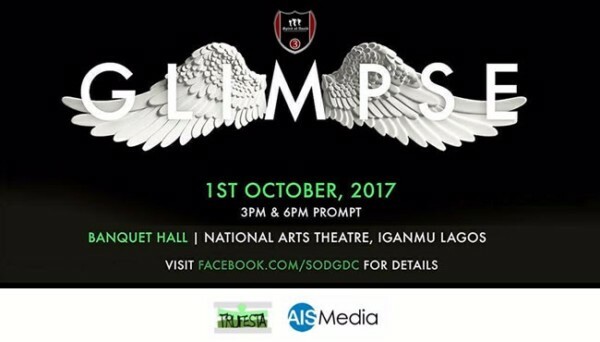 This year’s show, ‘Glimpse’ has the preoccupation of opening the eyes of Nigerians to the way of love, kindness and respect for one another. The Glimpse movement is set to inspire Lagos, propel Nigeria and influence the world at large to choose the way of love. As little at it may seem, love comes with great impact and immense benefits. The interpretation is simple: True and lasting social freedom begins with individual acts of love! It is going to be awesome. About 100 professional dancers from all parts of Nigeria will hit the stage this October 1st to give you the best experience ever. You have not seen anything like this before. Tickets: VIP N5000 and VVIP N20000. If you are a group of 10, enjoy a special N20k gate fee that covers you all. So, what are you waiting for? Get your tickets now at http://www.3dancingmen.com/ glimpse/. Tickets are available for VIPs and VVIPs . Follow us on Instagram, Twitter, and Facebook for updates, and you just may win a free ticket.